← “The Diary Of Malcolm X,” Out At Last! I thought I would type up some of this before I erase this cassette tape. I did some slight editing. It was a little difficult to hear in that former ballroom, so there were some sound issues that impacted this. I’m surprised to be here (LAUGHS) to begin with. Because we were out there with Malcolm. Tomorrow was not guaranteed. We were living from day-to-day, sometimes from hour-to-hour. And I’m happy that people have not forgotten him. He was a brother. Above all else he was a brother. And he was honest with us. He never lied to us. Whatever he said, he meant, and whatever he meant, he said. And the best thing you can have going for yourself, I’ve learned, is honesty. You can depend on people; you know exactly what they are going to do. He spent much of the time–the OAAU was launched was on June 28th, exactly 50 years ago today–from that time, from June up until the next three or four months, he spent much of that time travelling, pushing that OAAU agenda. To the point that he actually got something that most people are totally unaware of, the African countries, the heads of state, when he went to the OAU [Organization of African Unity] conference in July 1964 in Cairo. He issued a statement outlining his plan, and the African heads of state issued a resolution condemning racial discrimination in the United States. That was unheard of….None had done it before, and none had done it since…. And when you put that in the context of the time when this country was involved in a major propaganda war. [The United States] could tell the U.N. to kiss my behind. But even to have to discuss the possibility of this country being taken before the U.N. Commission of Human Rights–J. Edgar Hoover did not like that. They had him followed around Africa. They tried to set up situations were he was not greeted [by the African leaders]. I mean, he was treated like he was a foreign minister to black folks to the world. That’s how he was treated. He was invited as an observer (not a participant) to the OAU conference. And of course, he could hold press conferences, he could distribute documents. So they were giving him recognition. And, of course, the foreign minister of Tanzania, later in December, spoke at an OAAU rally. And in December 1964, when the U.N. was having the debate about the U.S., Belgium and England invading the Congo, two African ambassadors–from Ghana and Guinea–basically said, “If you have the right to military intervention, then we have the right to intervene in Mississippi to protect Black people who are being killed.” I’m paraphrasing. But that was unheard of. I’ve read about 40 pages of the diary [on microfilm]. I thought it was phenomenal. It spells clearly what he was doing and how he was being recognized by governments abroad….And this really caused an uproar. When you read that diary, and see all those people he was meeting and talking to having conferences with and being greeting by, it was serious. It was serious, man. And it only makes sense when you put it [in the context of] that period, 1955 to 1965, when he was basically under siege, that was the height of the so-called Cold War. That was the height of the Civil Rights Movement. And Brother Malcolm understood the propaganda thing. This country only moved under international pressure. President Eisenhower said he couldn’t do anything about Little Rock. Then, one day, somebody showed him a copy of Pravda, and Little Rock was all over the front page. So the next day, he nationalized the Arkansas National Guard. President Kennedy said he couldn’t do anything about what was happening in Alabama and Birmingham and all those places. Until word got out that Black folks were talking about defending themselves. And the next thing you know, he federalized the Alabama National Guard. So Brother Malcolm understood the necessities of propaganda to compel the federal government to do something. He understood that. Brother Malcolm was killed by a collaboration between some of the elements of the Nation of Islam and the FBI. So anybody who says anything else doesn’t know what’s going on. Martin Luther King’s movement did a very important thing: it eliminated legal white supremacy. It did nothing else. Nothing else. Now, eliminating legal white supremacy is very important. And even that, Brother Malcolm played a role as an alternative! Clarence Jones, King’s attorney, who kind of played a liaison role between Brother Malcolm and Dr. King, told me a funny story. Clarence said that Brother Malcolm told him to tell Martin, “Look, I know that every now and then you have to attack me, I understand that.” When Clarence told Martin, Martin laughed, and [joked], “Malcolm is the devil!” I didn’t find this out until years later, but there was a movement going afoot to have these two brothers meet….Now, whether or not they would become homeboys, I don’t know, but I think they would have developed a working relationship. [Brother Malcolm] succeeded in putting the Movement on the international level. He succeeded in raising the consciousness of people like myself, that 50 years later we still have that kind of consciousness. He succeeded in causing this government to do some things that it probably wouldn’t have done otherwise. Just the little bit of time that he was around! He got people talking internationally! He made me understand the psychological manifestations of the white supremacy were as nearly as devastating as the physical manifestations……Brother Malcolm talked consistently about how these people went after our minds. And they have been very successful. So he made people like myself see that movies, television, books, songs, all of that stuff, is part of the psychological attack…. He was never able to establish an organization because he was killed before he could do so. In fact, on February 21, 1965, he said to about five of us who were back there [in the Audubon] that he was going to go to Mississippi to speak at the invitation of SNCC, but that after that he was coming back to spend the next six months building up the OAAU. And since he was an organizer, the OAAU would have been [well] organized. But he didn’t have the chance to do so. He was first trying to lay his foreign thing out–he spent six months doing that, and then he was assassinated. It took me a while to give Dr. King the credit he deserved….But after I began to read Dr. King and read “Where Do We Go From Here: Chaos or Community?”, this was not the “I Have A Dream” person who was being projected. [Talked about Malcolm X speaking in Selma] He went to Selma to try to speak to Dr. King. Brother Earl and I go back to when he was in the Nation….Brother Earl used to give me tapes. And I knew two people who were in the Nation, and I was very friendly with them and knew them very well. I knew Brother Earl, I knew Brother Benjamin….I met Brother Earl in the bookstore. In Mr. Michaux’s bookstore. When I first met Brother Malcolm….you know what we used to talk about? Books. People don’t realize how much that man studied….Mr. Michaux would choose the books that he thought Malcolm should be reading….How many of you know that Malcolm X could discuss Shakespeare?….. The Thursday before he was assassinated, I was on that committee. and we discussed whether he should speak that Sunday. Herman Ferguson, who is not here [at the event] today, was on that committee. And I argued that he shouldn’t speak that day. Now, Malcolm was very democratic, something the United States is not about. He said, ” So let’s take a vote.” And the other side prevailed, and wanted him to speak. And I got very angry about that, openly. Malcolm put his arm around my shoulder and walked me over to the other end of the room. 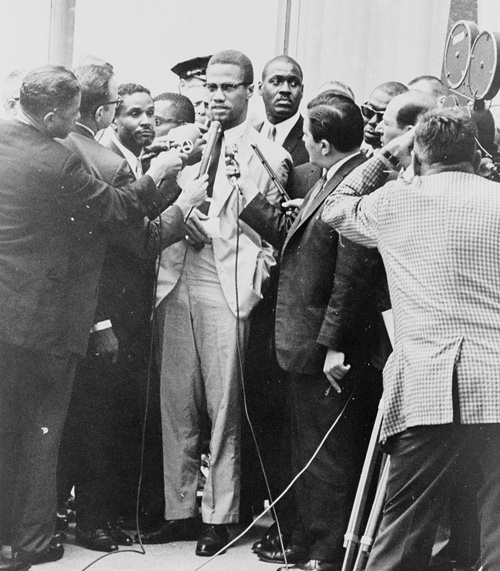 He said, “Brother, you’re very upset about that.” I said, “Yes.” I’m going to say this about Malcolm X: that brother was not afraid of anything. He looked me in the eye. He was not afraid of death, and he knew it was coming. You can believe me or not. He knew it was coming. And that’s why we still talk about him today. He was an interesting man and we need to do far more writing about him, but we need to study him moreso. Because after he was assassinated, there was a fundraiser for him at Sidney and Juanita Poitier’s house sponsored by her. You should know people like Flo Kennedy, the lawyer. You should know all these different people. The sister that died recently, Ruby Dee. I mean, these people were stand-up people. And they lived very well…..And what they did was put some people together….and to raise money for the family. We had Dizzy Gillsespie play for us. You see, you never knew who was around Malcolm X….. If you remember, Peter, I bought Dr. Clarke to the meeting. When we had our first meeting…..I thought Malcolm needed some knowledge from him he could use. In the original edition of “By Any Means Necessary.” There is a photo in that book. I am in that photo…. There are people who need to come forward and talk about the different things that he has contributed. Because I knew many people who knew Malcolm very well. And no one has interviewed them, because they didn’t want it to be public. Because they thought it would ruin their careers. And again, Brother Earl, I really love you, because you [helped us] do many things. And when you were going to Ghana [right after the assassination], you came to me and gave me a lot of things and said, “I want you to take care of them, because I do not know if I’ll still be alive.” Do you remember that, Brother Earl? Forgive me for taking up so much of your time. And I’m happy to come out today and I’m happy to share my memories. Thank you. The assassination, I hate to admit it, has accomplished its goal [to stop radical change].